The Washington Middle School cast and crew of the upcoming production “Wizard of Oz” practice Tuesday evening at the Historic Washington Middle School Auditorium. With just a few days left to practice, each student worked hard to ensure their part was precise. Dorothy (played by Analese Mitson) talks with Professor Marvel (played by Wes Pickering) who is peering into his crystal ball. The students were continuing to finish sets and gather props during practice Tuesday. 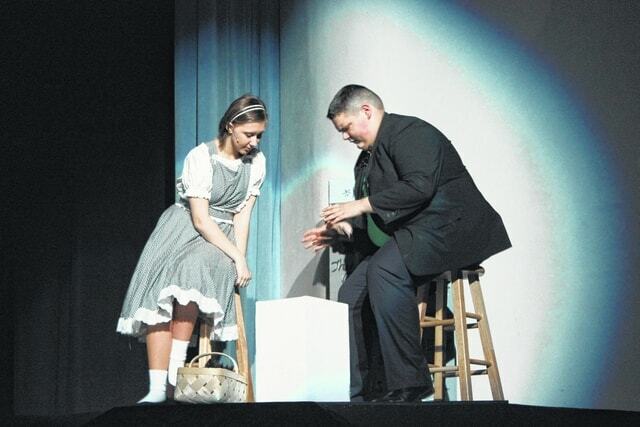 The community is invited to visit the magical land of Oz this weekend. The “Wizard of Oz” is a 1939 film that has been redone and adapted for audiences of all varieties over the years. 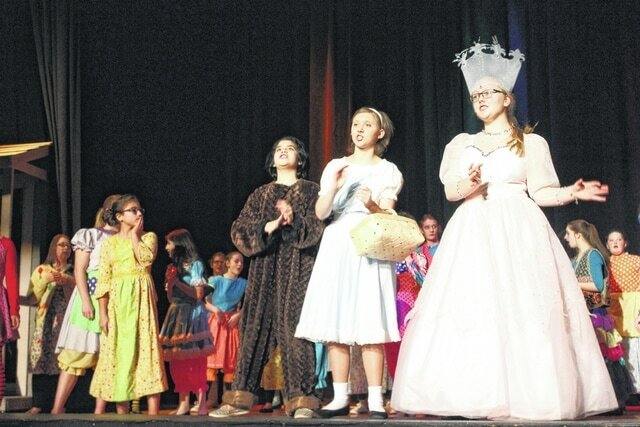 Now, Washington Middle School students will perform another rendition of the production for the county to enjoy on Saturday at 7 p.m. and Sunday at 3 p.m. The production will be held at the Historic Washington Middle School Auditorium. Tickets for the event can be purchased at the door or all this week from 3:30 to 5:30 p.m. at the Historic Middle School Auditorium. Adult tickets are $6 and students and seniors will pay $3. For the production, Dorothy will be played by Analese Mitson, the Scarecrow will be performed by Reilly Downing, the Tin Man will be played by Levi Hites, the Lion will be performed by Daniel Roberts, and Toto the dog will be played by Isabel Fernandez. This doesn’t include the various other roles, including the Wicked Witch of the West, Glinda the Good Witch and other familiar characters. For more information about the production or to purchase tickets, the community can visit the Washington Middle School. https://www.recordherald.com/wp-content/uploads/sites/27/2017/02/web1_IMG_2873.jpgThe Washington Middle School cast and crew of the upcoming production “Wizard of Oz” practice Tuesday evening at the Historic Washington Middle School Auditorium. With just a few days left to practice, each student worked hard to ensure their part was precise. https://www.recordherald.com/wp-content/uploads/sites/27/2017/02/web1_IMG_2859.jpgDorothy (played by Analese Mitson) talks with Professor Marvel (played by Wes Pickering) who is peering into his crystal ball. The students were continuing to finish sets and gather props during practice Tuesday.